This service for your room is like tech support for your computer, without the endless on-hold muzak. You want to tweak your room but you don’t know where to start or you have an idea of you want but don’t know how to put it together. If you’ve ever wanted to spend an hour with a interior designer, just talking about interior design and/or ideas for your home, now’s your chance. For one hour, we’ll talk via Skype, discussing anything that interests you in interior design. We can discuss design styles, your DIY projects, common home design dilemmas, great places to shop…you name it. This is a great option for anyone looking at all of the other consultations available and having difficulty choosing what they need. I can help you prioritize the order of your home design projects and take the stress out of your planning. You bring your notepad and I’ll bring my expertise. 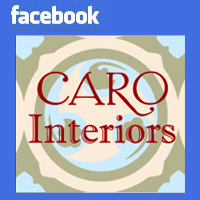 This is the online version of the most popular local design service offered by CARO Interiors. With DIY Design, you just pay for the design. You’ll get a detailed, complete interior design with a step-by-step guide to help you implement it in your home. Many of my clients like this service because it gives them greater control over their room’s installation schedule. Have a big family holiday coming up? Hectic school schedule have you on the run? You can tackle bite-sized elements of your design that won’t leave you feeling like a slave to the weekend warrior lifestyle. Labor costs are often what make professional interior design seem unapproachable to slender household budgets. If you add up the costs of some interior design projects, labor can cost more than the materials. You will save a lot of money by building your new room with your own sweat-equity. You also can break down the project according to your own budget needs. Suppose that you can only afford to paint right now. You can get that painting done, confident that you’re moving toward a larger goal. When your budget is ready, you move onto the next part of the design. Request of Service: This step begins the DIY Design process as soon as you place your order with PayPal. When I receive your payment and your preferred contact phone number, I will call you to schedule our Program Meeting. Design Time: This time period of roughly 4-7 weeks is when I am working to pull together everything for you room. I’ll be brainstorming, drawing, making a source lists, ordering fabric samples and doing all of the other tasks that go into your making your new room just right for your home. I may call you during this time if I need your opinion on specific items and you can call me anytime if you have any questions or ideas you need to share. When you are ready to put your new room together, you can go forward with confidence. No more does-this-match or is-this-furniture-the-right-size guesswork for you. You know exactly what you want and you have a plan to make it happen when you want it. This is unique, affordable and comfortable living at its best. See a design service that could help you? Want more info or have a related question? You can drop me a line on the “Contact” page link at the top of the website or just click here.